Well, I didn’t actually take any photos on New Years Day, so you’ll have to settle for January 2nd. The year started off cloudy for us, which isn’t unusual since we live in the Pacific Northwest. 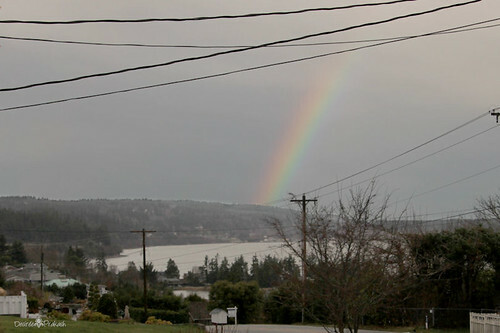 On the 2nd we were heading out of the house and my older son pointed out this lovely little rainbow. So I grabbed my camera and got a shot from my front porch before we left. This is my first photo for my Project 52 this year. This entry was posted in photos, project 52. Bookmark the permalink.